Posted April 30th, 2015 at 10:44 am. 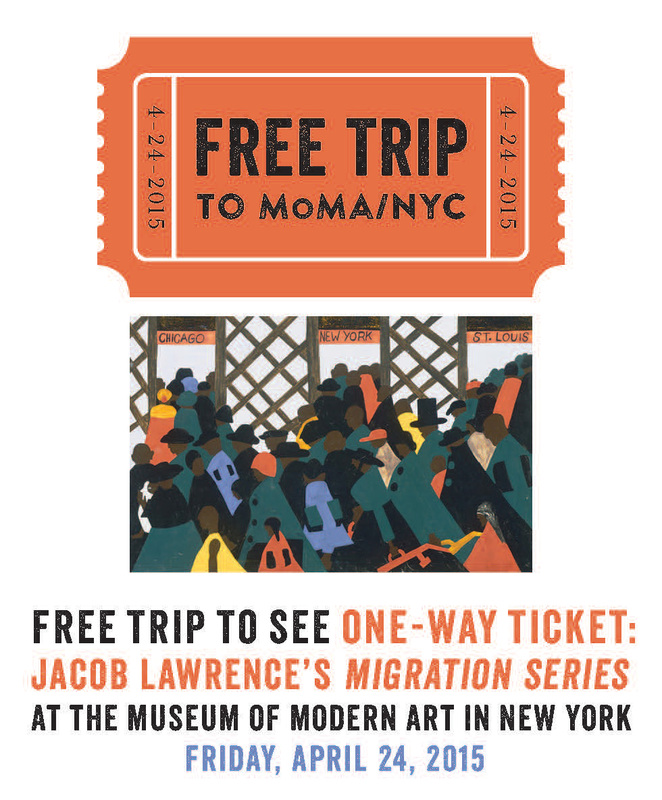 Seats went fast for the free April 24 trip into New York City to see the exhibition One-Way Ticket: Jacob Lawrence’s Migration Series. Within minutes of posting the all-campus email invitation earlier this month, the History of Art department was deluged with eager responses. That enthusiasm carried through to the day itself, when a busload of Bryn Mawr students, faculty, and staff traveled to New York’s Museum of Modern Art to see the critically acclaimed exhibition. One Way Ticket features Lawrence’s iconic series of 60 panel paintings depicting the Great Migration, the multi-decade mass movement of African Americans from the rural South to the urban, industrialized North. Rendered in pencil, ink, and tempura paint on hardboard, the panels in the cycle chart that voyage with a visual language at once spare and dynamic, classical and proto-cinematic. “It’s as if the historical ambitions of the Bayeux tapestry were to find their form in the filmic storyboard,” says History of Art Chair Lisa Saltzman, who organized the trip. In the exhibition, Lawrence’s artwork is surrounded by the material traces of the culture that inspired and echoed his ambitious artistic undertaking—first-edition book covers of Richard Wright, Ralph Ellison, Langston Hughes, archival clips of performances by Marian Anderson and Billie Holiday—and accompanied by a sobering archive of photographic images from the period. “The Migration Series demonstrates the ongoing possibilities of history painting in and for the modern era,” says Saltzman, who saw the exhibition as an opportunity to reach out to the entire college community. For more on Bryn Mawr’s Department of the History of Art, visit the department’s homepage.